Let us say that we don’t actually think that Australia’s batsmen are all that bad. They are good players playing badly, which is slightly different. Batsmen under pressure are exposed more than bowlers because they don’t get second chances. You do something stupid that gets you out and that’s your day over. Bowlers at least get to go back to their mark and have another stab. Australia’s batsmen have played pretty stupidly at times during the 2010 Ashes series, but it’s the bowlers putting them under pressure. Katich, Hussey and Haddin are all fine. If he could stop running his partners out, Watson would be doing a job, particularly when you consider that he’s an all-rounder. Ponting down the order with intact fingers on his hands and without the weight of the world on his shoulders would be fine too. He really would. Michael Clarke’s gone mental, but it’s more obvious when no-one’s making up for his failures – he’s basically fine. Phil Hughes may or may not be fine, we still haven’t decided. Steven Smith is not fine. How Steven Smith ended up at number six is beyond us. He’s got a good first-class record, but he’s as easy on the eye as foreskin trapped in a zip. Rule one of all-rounders is that they have to be worth their place as either a batsman or a bowler. Smith isn’t, as far as we can tell. Having him bat at six is tantamount to sabotage. With Smith at six, Ryan Harris notching up king pairs at eight and a bowling attack conceding a volume of runs measured in thousands, Australia’s batsmen had to do more than their fair share of work. There are worse things wrong with this Australia team than the batting. Most Australian batsmen were fine. And therein lies the problem. In test cricket, you need to be more than just fine. You need to be pretty darn good. You need to have at least one guy posting a big score. That, sadly, didn’t happen. Deep cower: i think you are being too generous to ponting, pup, north and possibly smith. Averaging sub 25 is not fine. That is piss poor. Piss poor and fine are worlds apart. Smith did what was expected… not much. Although it;s pretty hard for youngster to shine when the older, wiser heads have all failed before him. 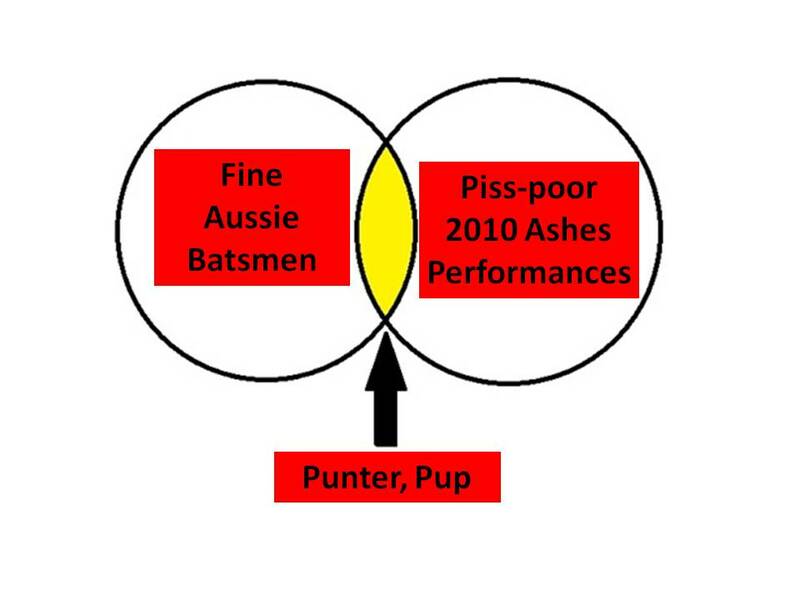 I should add that I think Phil Hughes will be a fine test batsman and that Marcus North ought to be a fine test batsman – perhaps he is destined to be an Aussie Hick/Ramps. Too soon to tell re Smith but he is no top order test batsman yet and if he is to morph into one it will take a while and it won’t happen while pretending to be a test No 6. The series is not over yet. Imagine what an anti-climax it will be if we lose in Sydney. Nice use of the word foreskin by the way. There”s not enough genitalia in modern cricket journalism. Picking Smith above Haddin was mentalness of the highest order. For that I can only applaud the Aussie selectors. Deep Cower – apologies for asking if you were Mitch’s overbearing mother many threads ago, but so far he’s had one very good game and two terrible ones. Not the ratio of a worldbeater. Talking of journalism, I heard JRod on 5 Live yesterday. He was described as “a journalist”, and also as “a bitter Australian”. Presumably at the time he was a Victoria Bitter. Did I mention that Russian proverb before. It was in an Aussie paper, and I liked its appropriateness so much that I have quoted it to everyone. Can’t remember whether here or not though. In a pond with no fish, a crab is a fish. Shane Watson is not an opening bat, but they don’t have any others, so he is. Philip Hughes is not and never will be an opening bat (if anything he is a #6), but they don’t have any others, so he is. Pup is not a test captain, but they don’t have any others, so he is. Steve Smith is not a test batsman, but they don’t have any others, so he is. Australia’s biggest problem is that they’ve spent four years with their eyes wide shut assuming that all these people are those things simply by virtue of being Australian, and so not actively doing anything to find and/or create real ones. Time now to go and find some proper players, give them a couple of years, and make an entirely new test team. I’m enjoying this analysis of Australia’s problems. Can you stretch it out a bit longer please? The Dawg: I am no admirer of Mitchell Johnson – I thought it would be fun to talk him up amongst a bunch of English people (and in all fairness, he did perform well in that test). After all, there’s no harm saying something provocative once in a while, is there? brad: My first sentence was misleading – I didn’t mean to say they did well in this series, but that you have to be more than just fine to be a test batsman. Bert: I disagree with your assertion about Phil Hughes – from what little I saw of him, he is a natural stroke-maker and would be a good opening bat if he gains more experience. It’s not his strokes that are the problem, DC. Stroke players play test cricket at 4, 5, 6 & 7. He has a specific job to do (see off the new ball without getting out) that he is entirely unsuited to. Against a decent patient attack he is useless. They’ll McGrath him to death, bowling on a consistent line outside his off stump. Sometimes he slashes from ball 1. Sometimes he remembers his job and leaves a few. But the result is always the same – eventually he slaps a wide one to backward point or nicks a drive that wasn’t there. Every now and then he’ll get 100 in 70 balls, which will increase his average to 30. If he is to play (and I think he should), he needs to develop from 6, preferably after the openers have put on 150. He could be a devastating player, but not an opener. Bert, I agree in part. Anyone know if Hughes has opened all his career, or if it’s a recent move, as with Watson? Given the way he plays, both his mindset and his technique, you’d would expect that someone would have twigged by now. That said, were he to shore up his technique, you can see a place for him at the top of the order. Think Slater/Sehwag etc. It’s not that uncommon to find a stroke player there. Oh dear. I’ve just argued myself around in a circle. Time to put the party hat on and give an underwhelming “meh” to 2010. Hughes has been seen as an aggressive opener throughout his first class career. He scored sh*tloads for Middlesex (I know KC thinks 2nd Division runs don’t count) and looked the cats pyjamas back then. Remember he did that off the back of tearing into the Saffers, which is certainly not a Div 2 attack. Hughes will come good and probably make us weep – but not just yet! Hughes started with NSW as a middle order batsman but has stepped up to opener where he had most success. He was the standout batsman for NSW. He is out of form right now, but I am confident he will be a thorn for many an English attack in years to come. If I remember rightly Alastair Cook and Andrew Strauss were pretty crap openers on their last visit to Australia, with Strauss particularly being fairly limited to a slash outside off. Smith is not a number six yet but it doesn’t mean he can’t tighten his technique and improve his concentration. Watson may even learn to run between wickets.